Yes, writing “Pho Of Faiths” in the title is as imaginative as writing a blues song that begins with “Got busted for somethin’ I didn’t do.” But I think it conveys some truth. Cao Dai was founded in the 1920’s as a univeral faith, but it also reveals interesting things about Vietnamese culture. 1. 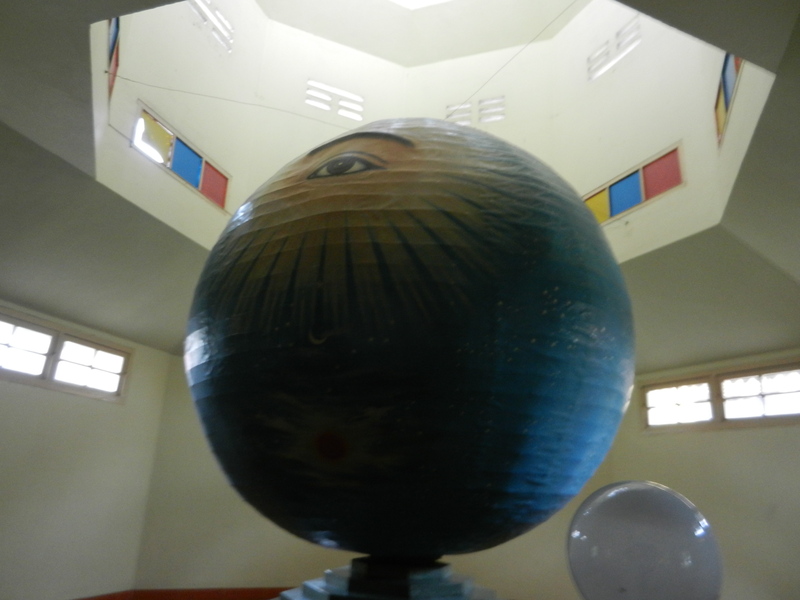 In 1920 a provincial governor (of Phu Quoc) named Ngo Van Chieu (also known as Ngo Minh Chieu) intuited that all the world’s religions emerged from the same source and that they should realize their common well-spring. Followers of the faith believe that he received this message from the Supreme Being–the term Cao Dai means heavenly abode, and it’s the symbolic name for the Supreme Being. 2. About a week later, Chieu was resting in his hammock and a huge eye emerged in front of him, shining like the sun, with a halo around it. 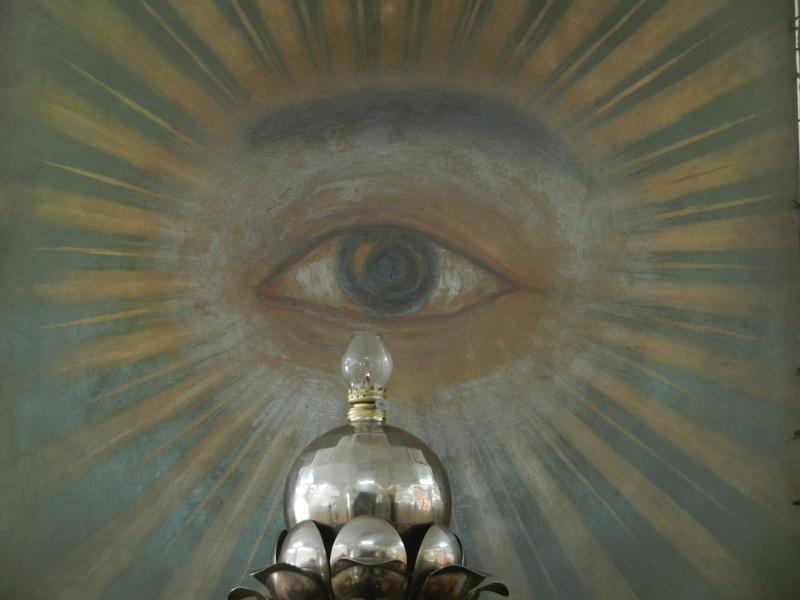 He became convinced that this was the way God wanted to be symbolized–the all-seeing eye of universal consciousness and global harmony. 3. The Cao Dai religion was formally founded in 1926, and a governing body was put together that resembled the Catholic Church’s–a hierarchy of priests, higher officials responsible for districts and one person at the top (called Giao Tong) who leads the whole organization. 4. Caodaiism borrowed from many religions. It teaches that all religions are one, and that they were created by the Supreme Being in different times and places. It thus respects all beliefs in God and all cultures. If you look closely at the above photo, you can see one of the 8 trigrams in Daoism over each of the 3 colored slats around the Divine Eye. The Supreme Being emitted Yin and Yang patterns of energy. They differentiated into the 8 trigrams, and they became condensed into the material things in the universe. But Caodaiism’s borrowing of ideas didn’t stop at this Daoist view of the universe. 5. Cao Dai followers believe that there are elevated spirits in the heavens who communicate messages from the Supreme Being. The 19th century French poet Victor Hugo is one of the most highly honored–he’s in the middle of the above photo. On his left is Sun Yat Sen, the leader of the 1911 Chinese revolution which ended the last imperial dynasty. On Hugo’s left is a revered Vietnamese poet from the 16th century, Nguyen Binh Khiem (also called Trang Trinh.). All 3 are signing an alliance between God and humanity. 6. 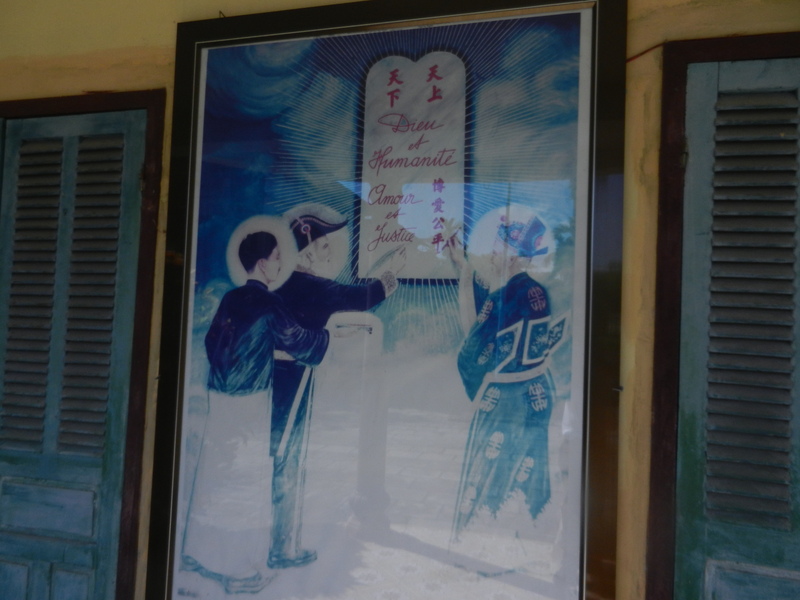 Cao Dai followers also believe that the Supreme Being taught the Buddha, Jesus and Mohammed. Though their adherents have their own ways of approaching humanity’s spiritual goals, the Cao Dai faith tries to promote harmony between all religions. 7. 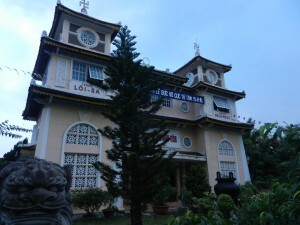 Some historians have seen the Cao Dai as a reaction to French colonialism. Some Cao Dai followers were patriots who tried to free Vietnam, and the French government suppressed the faith and exiled some of its leaders to Madagascar. But the Cao Dai faith promotes love and justice because all beings came from the same source and share its essence. Many currents besides reactionary politics engendered Caodaiism. 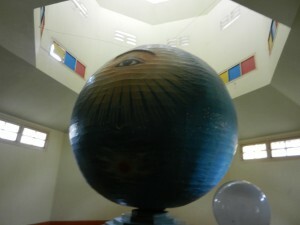 Like many other Southeast Asian cultural movements, it stresses harmony and blends ideas from many lands. At least 2 million people in Vietnam practice it (some estimates go up to 8 million), so we’ll take a deeper look at it in the next post on Cao Dai.